Facilitates buying in bulk. One of the best ways to save money on groceries is to buy bulk items at a discount. However, this doesn’t work if the food goes bad before you can eat it. If you use a food dehydrator to dry the food then it won’t go bad which means that you can more efficiently buy affordable food in bulk. Reduces spending on costly items. You can use a food dehydrator to make your own herbs, spices, dried fruits and camping food. All of these are expensive items when you buy them in the store but you end up paying just a fraction of the cost when you dehydrate them yourself. Increases the likelihood that you’ll make healthy food choices. 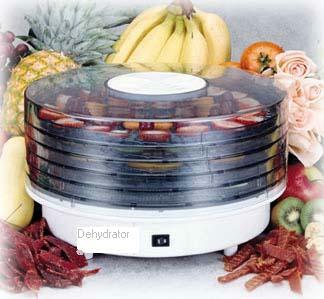 A lot of people use their food dehydrator to make healthy foods, support raw food diets and go vegetarian. If you do this then you’ll be healthier which reduces the money you spend on medical care. That’s a big savings – and an important step for your life! Gives you a gift you can always give. You can save a lot of money on gifts for others by using your food dehydrator to make homemade foods for people. I love homemade gifts so I especially love this point! Can even be a money maker. A smart person will further increase the savings of a food dehydrator by actually using it to make money. This can be done by selling dried foods, offering classes in food dehydrator use or writing articles about your dehydrator. So, what do you think – can you save money with a food dehydrator? This entry was posted in Uncategorized and tagged food dehydrator, frugal living, minimalist, minimalist living, saving money, spirituality, zen. ← February 3rd, 2011. 3 Dreams: Beach/Swimming/Lifeguards and Beach/Sand-Sinking/Church.